Kit Carson was a trapper and a mountain man of great renown. He served as an army guide, an Indian Agent and was a highly celebrated Army officer during the Indian Wars. The one-story adobe house, built in 1825, is in the Spanish Colonial style in the shape of a "U" with a front portal and wooden beams. The interior consists of nine rooms, seven of them original, which surround an open patio with a traditional Mexican mud oven and a well. 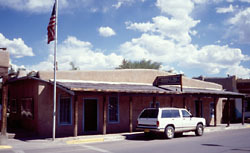 The Kit Carson House, a National Historic Landmark , is ½ block east of the Taos Plaza on Kit Carson Rd. in Taos, New Mexico. Open daily from 9:00am to 5:00pm. Call 505-758-4741 or visit taoshistoricmuseums.com for further information.